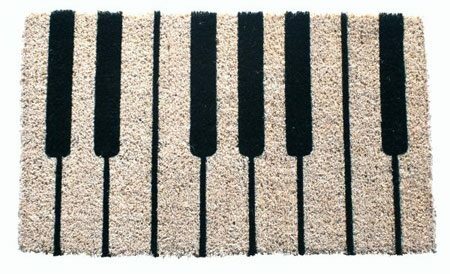 Handmade Piano Doormat – This gorgeous doormat is the perfect addition to the home of a pianist! Made by hand from high quality all-natural coconut fiber, the material used to create this mat is great at trapping dirt. The mat is also hand stenciled with fade resistant dyes to keep it looking at its best. A great complementary piece that will add a little personality to your patio or entryway! Size: 18″ x 30″; 3/4″ thickness.